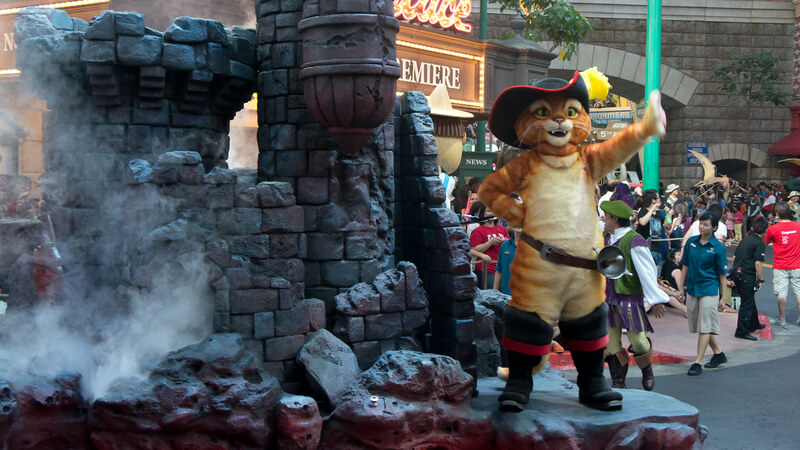 Universal Studios Singapore launched Hollywood Dreams Parade on 31 December 2011. 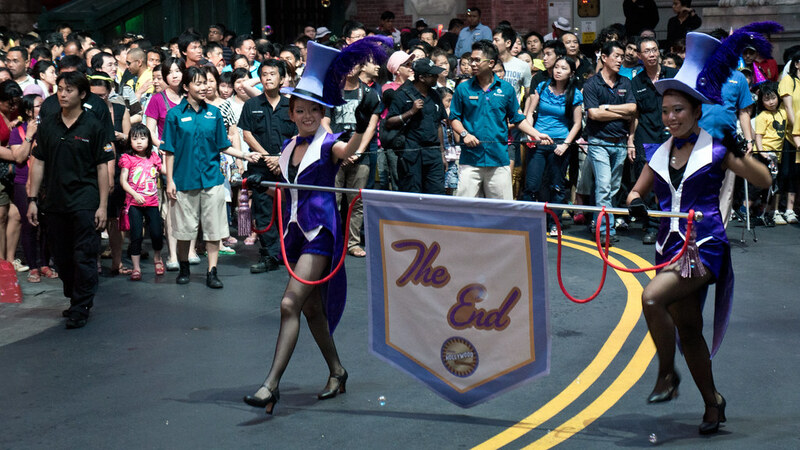 This is the park’s first permanent parade show and will be a regularly performed on the evenings of weekends and public holidays. 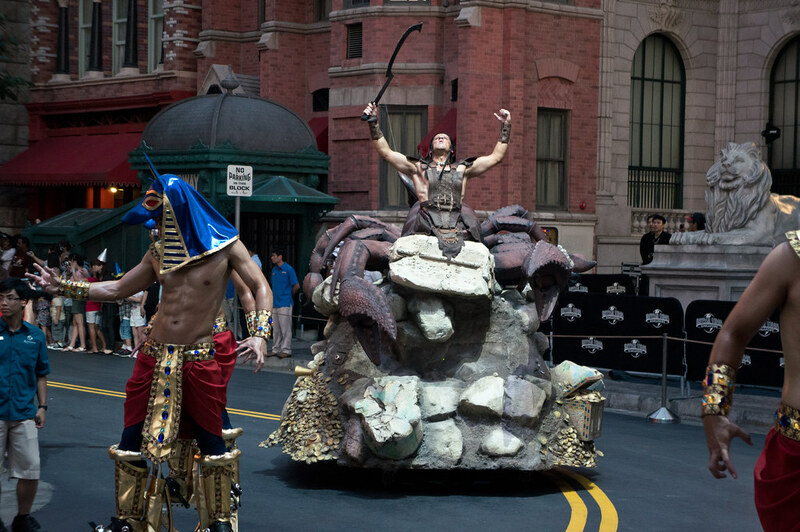 The parade starts from The Lost World and moves through Ancient Egypt, Sci-Fi City, New York and turns right before Hollywood (towards Stage 28). 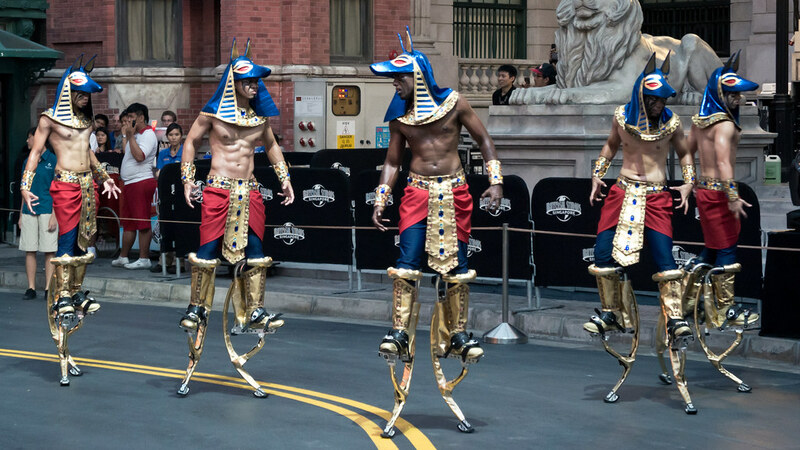 It is about 10 minutes long when viewed along the route – the total length of the performance is 30 minutes (for the performers). 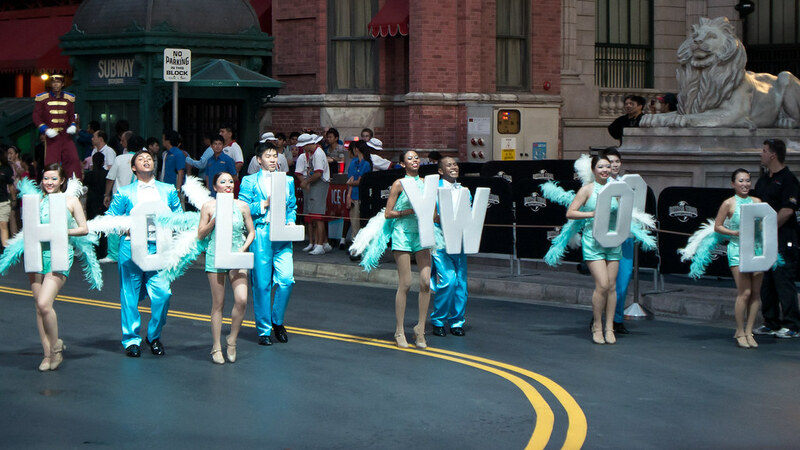 Featuring 14 floats and over a hundred performers, Hollywood Dreams Parade will dazzle and enthrall with its vibrant designs and engaging performance. 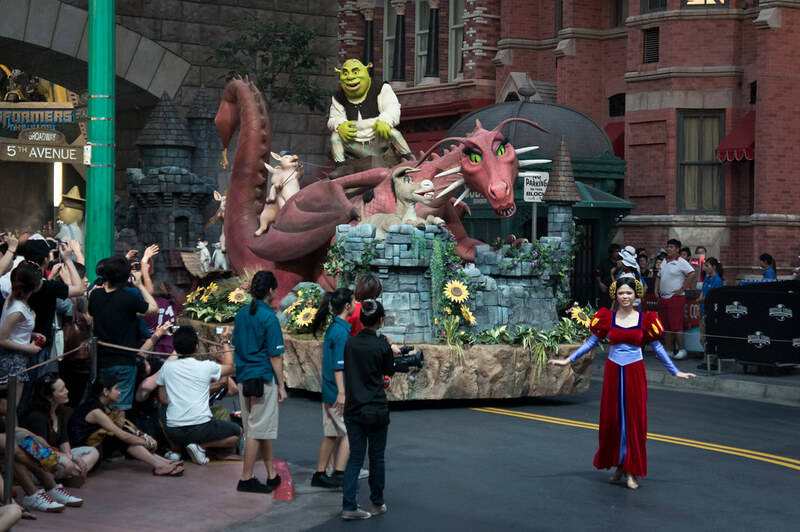 Here is an extensive photo entry of Hollywood Dreams Parade, giving you an almost complete photo tour of the parade, with my review at the end! 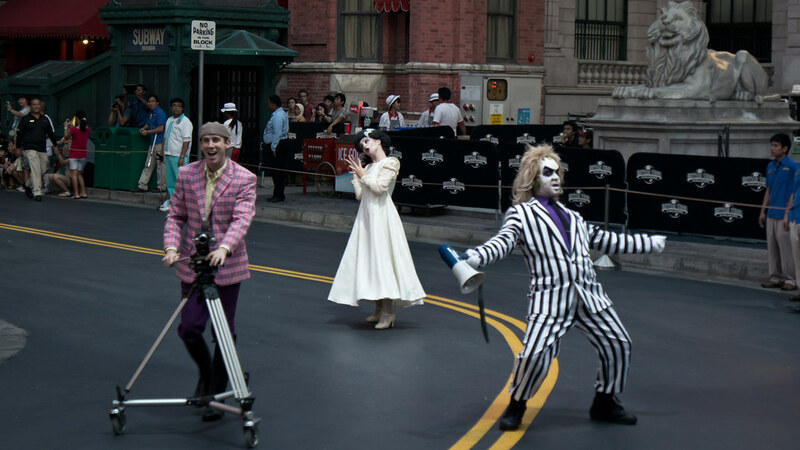 Moments before the parade arrives, we have the director, Beetlejuice, Dracula and the Bride of Frankenstein getting the crowds hyped up. 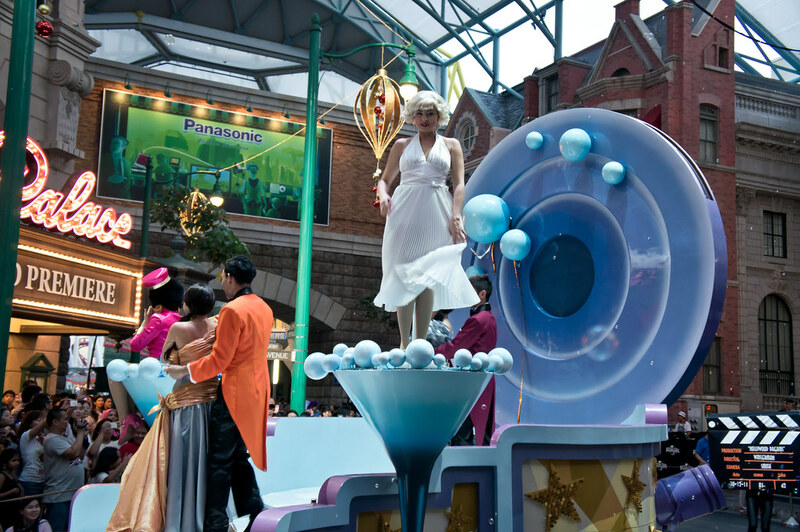 Hollywood Dreams Parade’s opening unit (or mini title float) is pushed by two dancers and it almost seems like Hong Kong Disneyland’s title float, except that over there, Dumbo is an animatronic. 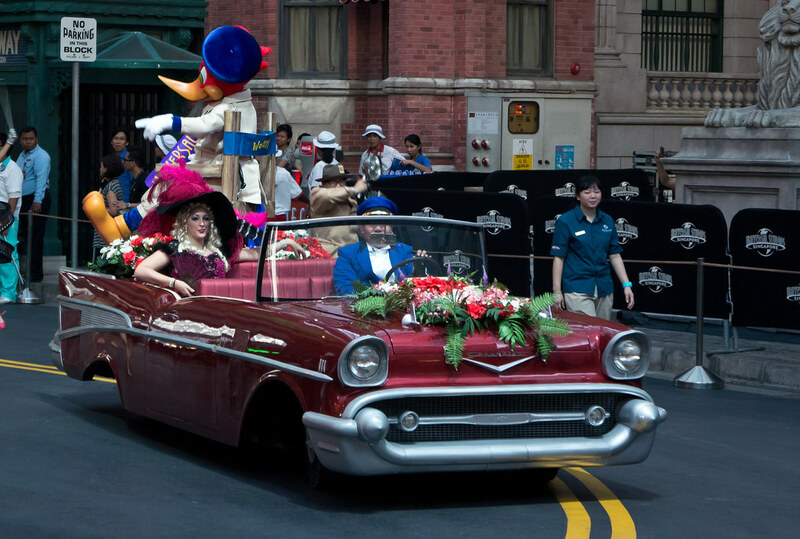 We have Mae West and Woody Woodpecker arriving in a vintage Chevrolet. 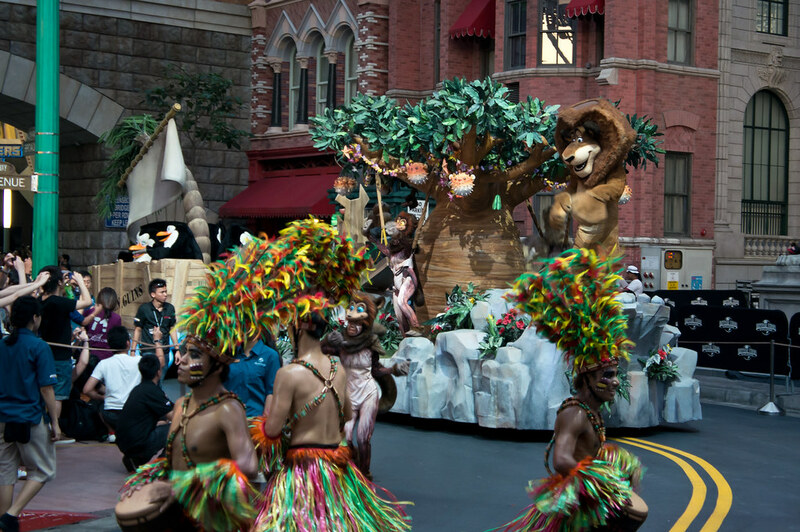 Colourful costumes and tribal dancers signal the transition to the Madagascar segment. 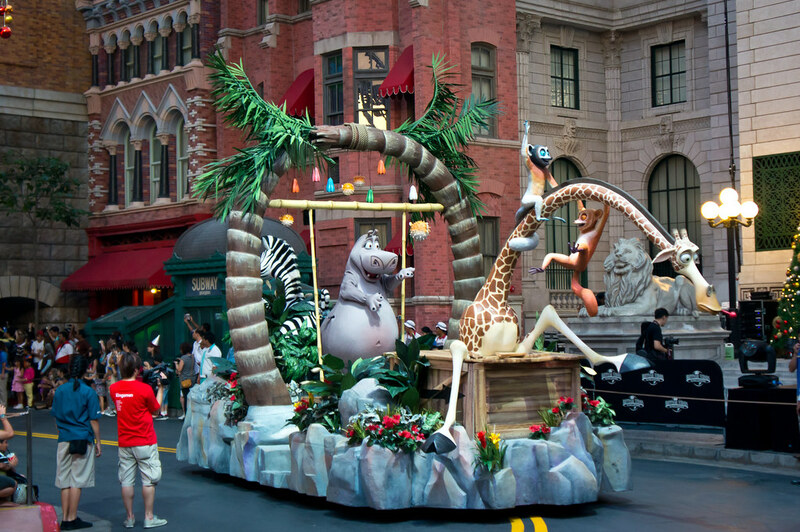 The Madagascar segment starts off with a very long float. This segment features all characters from the first film. Of course, the popular penguins! Alex’s friends are in the second, shorter float. After encountering the hyperactive and jumpy lemurs, we have the fairytale entourage from the Shrek film series. 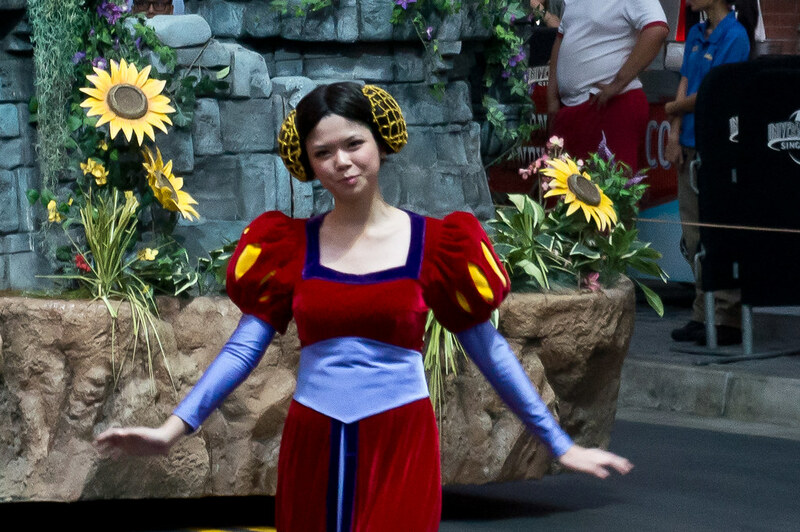 The royal dancers’ hair-do reminds me of Princess Leia. The segment ends with the adorable Puss in Boots (although he doesn’t seem to belong here). Where’s Fiona? The Dreams continue… to Jurassic Park. 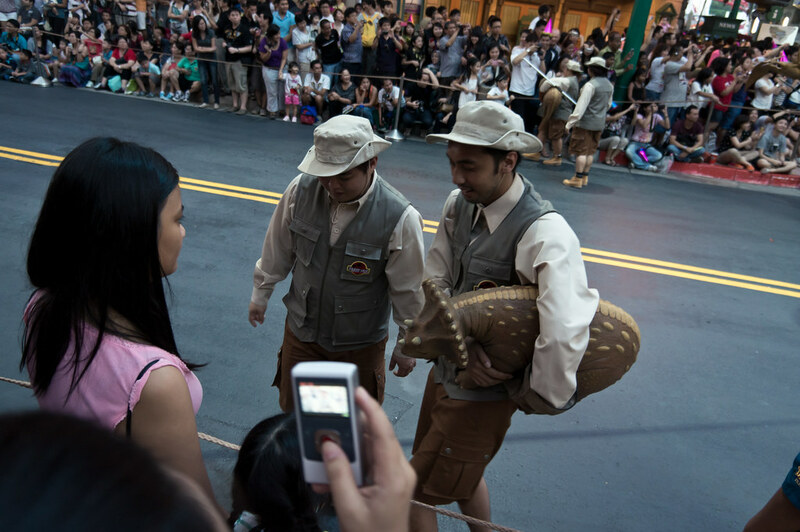 There are some minor interaction moments during the parade – each segment has 3-4 specific performers who will stop and greet the younger guests. 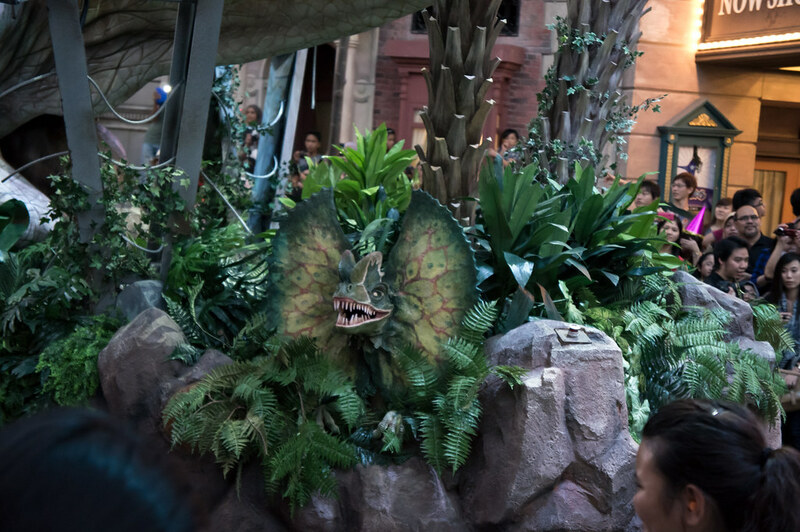 Here is an example seen at the Jurassic Park segment. 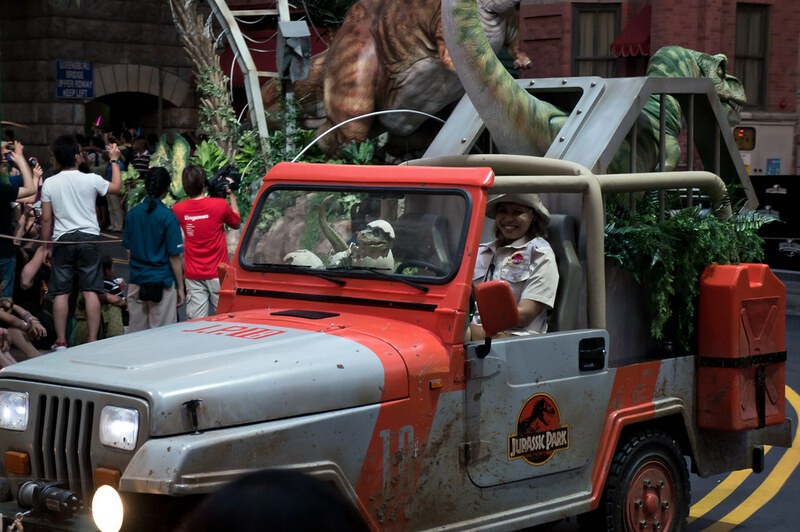 We have a suspiciously happy Jurassic Park crew here driving away with newly hatched dinosaurs! 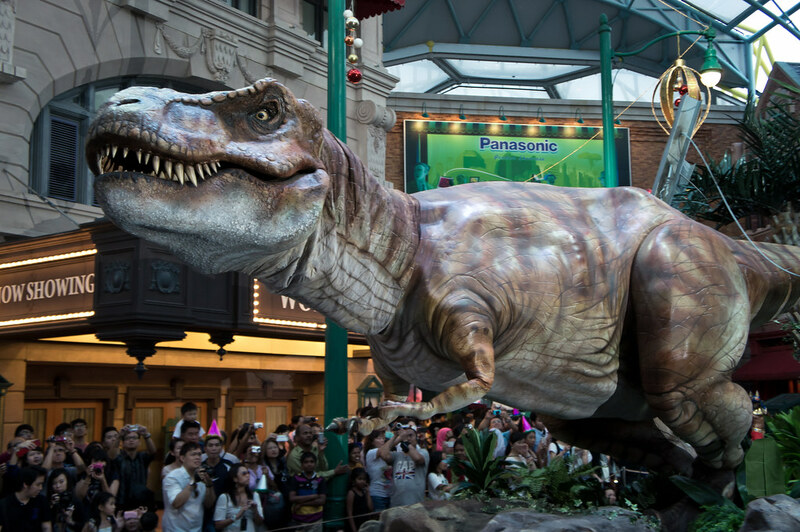 This T-Rex float is definitely the most impressive – unlike the Dragon from Shrek earlier (which only moves from neck up), the T-Rex here can lunge at guests! The movement is very smooth and dramatic too – I hope the park has tweaked/changed the T-Rex at Jurassic Park Rapids Adventure. Beware of the sneaky Dilophosaurus! Anyway, some of the ride floats spray water on guests. Harmless quantities, but annoying if the entire stream lands on your face. Just something to watch out for. Colourful Egyptian warriors march from Ancient Egypt. 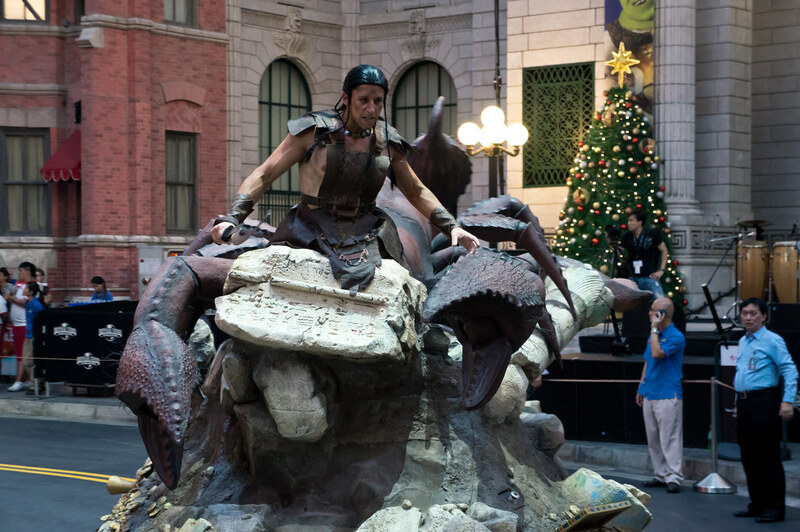 The Scorpion King (in Scorpion form) looks rather awkward, especially with that slab in front of him. It almost seems like he is sitting on a giant scorpion. 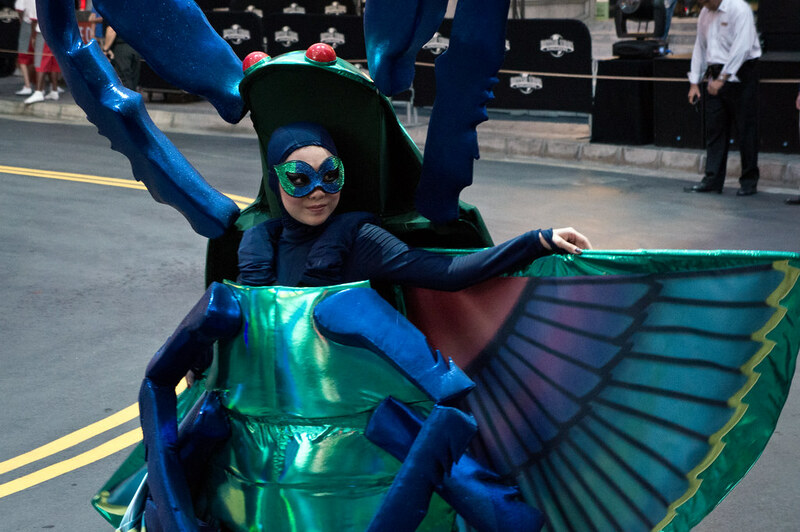 I guess it’s too difficult to have a costume where the actor wears claws for arms (just like in the films) and has a shell-like torso. He looks alright on the side though. 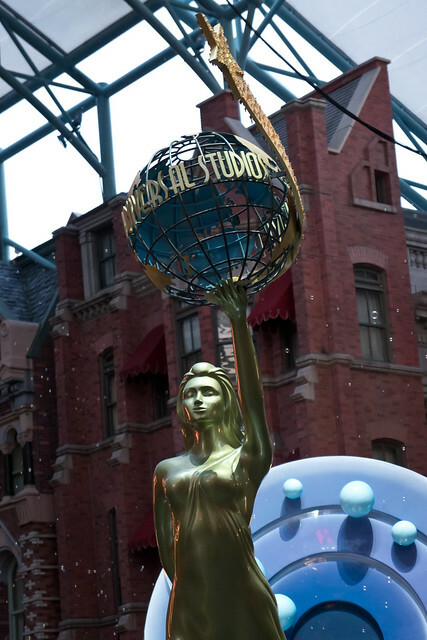 Finally, Evey has arrived at Universal Studios! And so is Ardeth Bay! 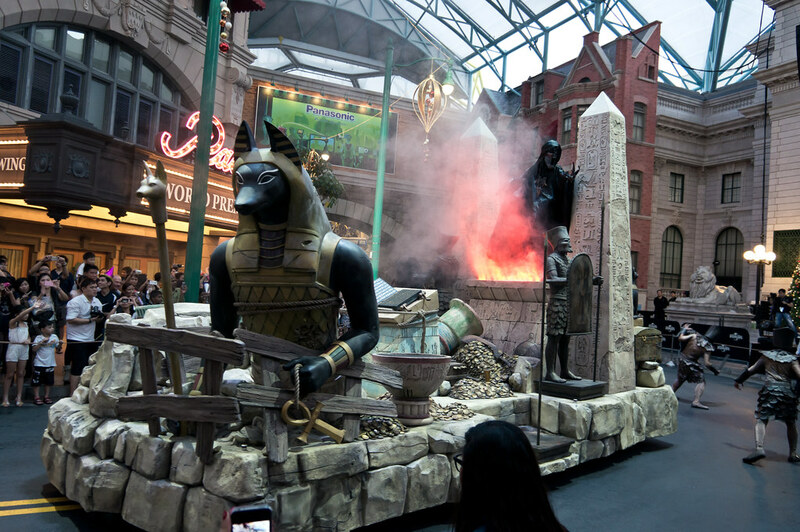 The Mummy themed segment has a minor stop where Ardeth, Rick and Evelyn battle the resurrected Egyptian warriors and Imhotep. 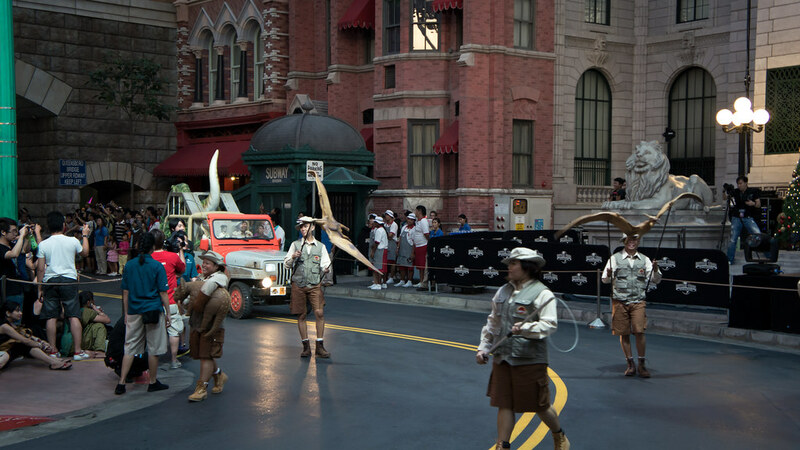 The action gets very close to guests and is a nice change from the “walk and wave” style seen for the parade segments before this. Towards the end, Evey will read an incantation from the Book of the Dead (which is supposed to lift his immortality but keep him alive – in the films, that is) which sets him up in “flames” and “kills” him. The Egypt segment ends off with colourful scarab dancers. 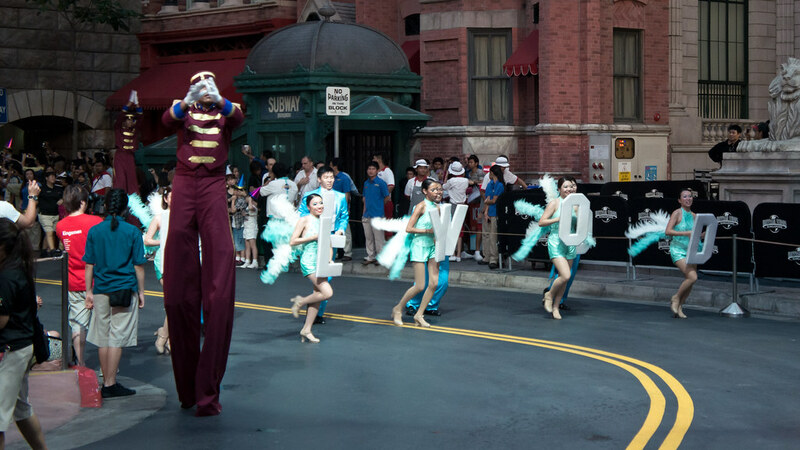 The parade ends off with “It’s a Wrap” – the Hollywood spectacle. 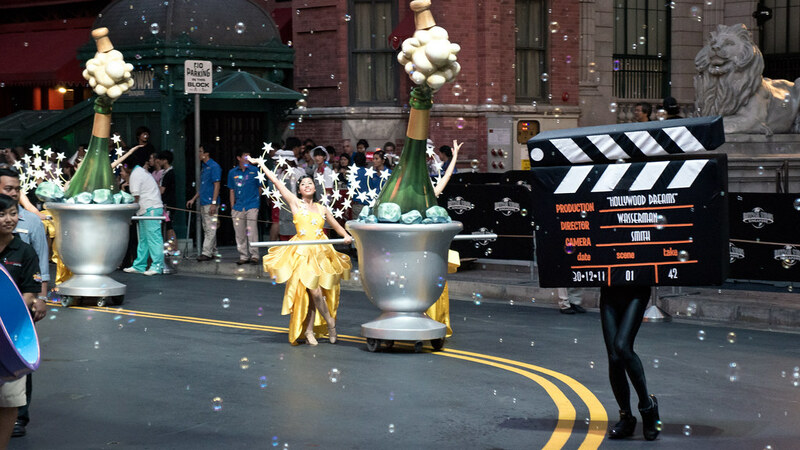 The parade ends off with a blast – champagne popping and bubbles! And it’s a wrap! Thanks for viewing the photo set! I only have the ending float’s chorus for now, it’s hard to make out the lines as the sound system was rather weak. Please leave a comment or contact me if you know better and would like to contribute! Hollywood, where movies never end. Movies stars are coming to town to make new friends! Hollywood, where dreams will never end. 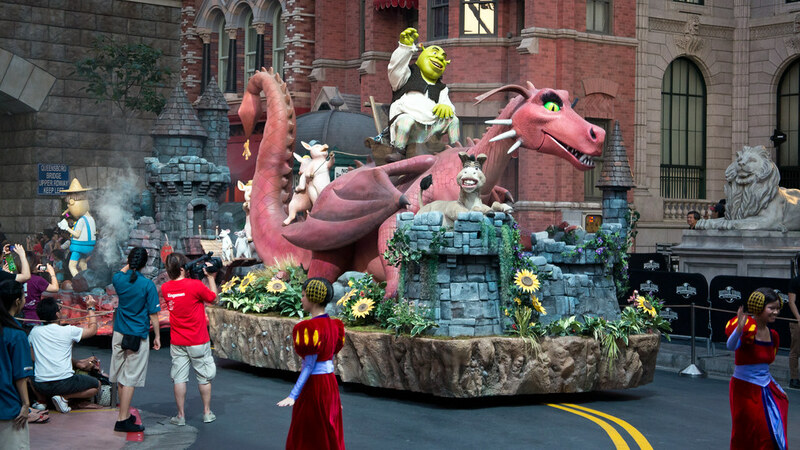 The Hollywood Dreams Parade will party on and on! 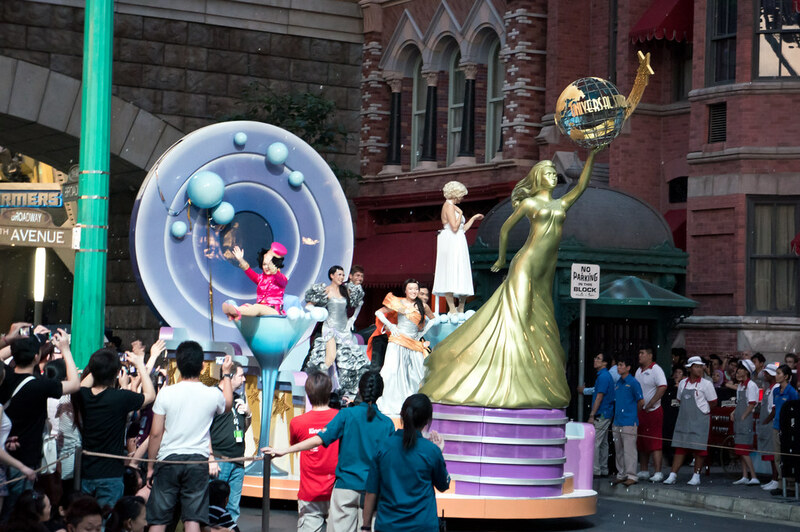 Hollywood Dreams Parade is definitely an important addition to the park’s line up of attractions – which has been missing a parade for the longest time. 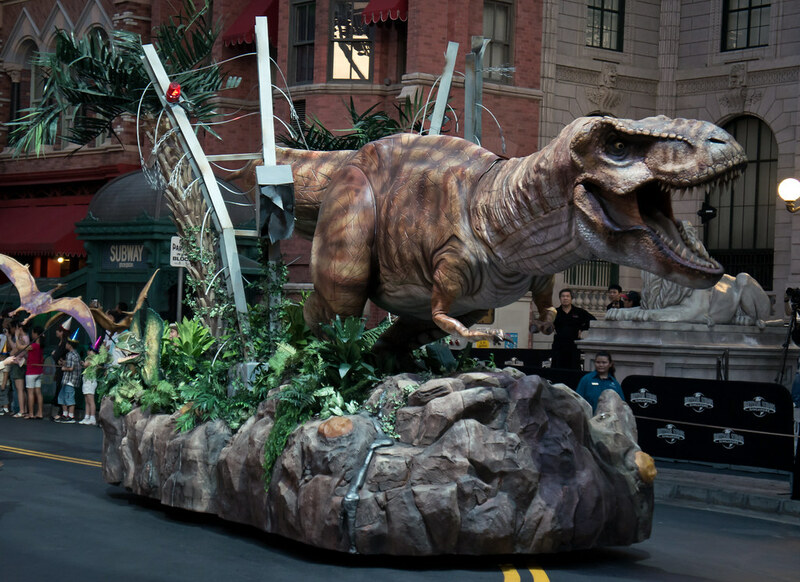 The parade route starts from the Lost World and ends after New York. The floats are detailed and nicely scaled to the park. This is not a Disney Park where there are wide open spaces and ample headroom for tall, extravagant designs. 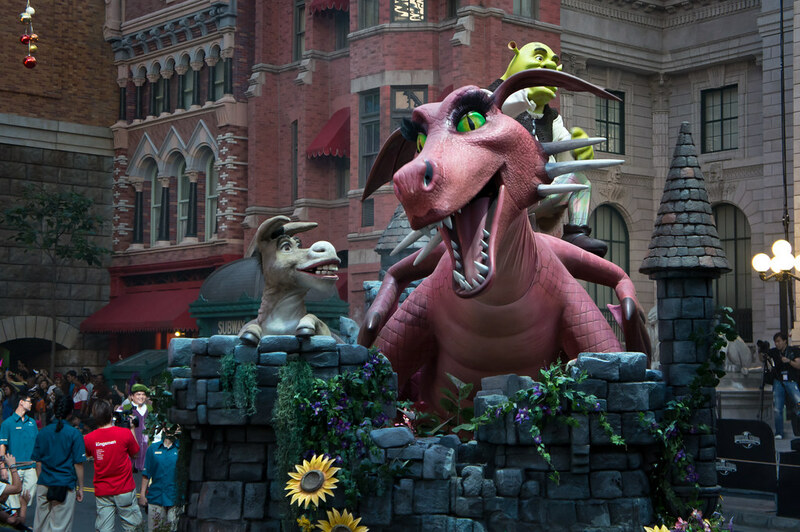 (Although I must say that I often lower my expectations for anything from this park – I still think that Hong Kong Disneyland’s Flights of Fantasy is a lot better – in terms of concept and execution.) Still, the park did not recycle any floats from the Grand Opening Procession. They are all new designs and it’s nice to see some spectacular ones with large characters. 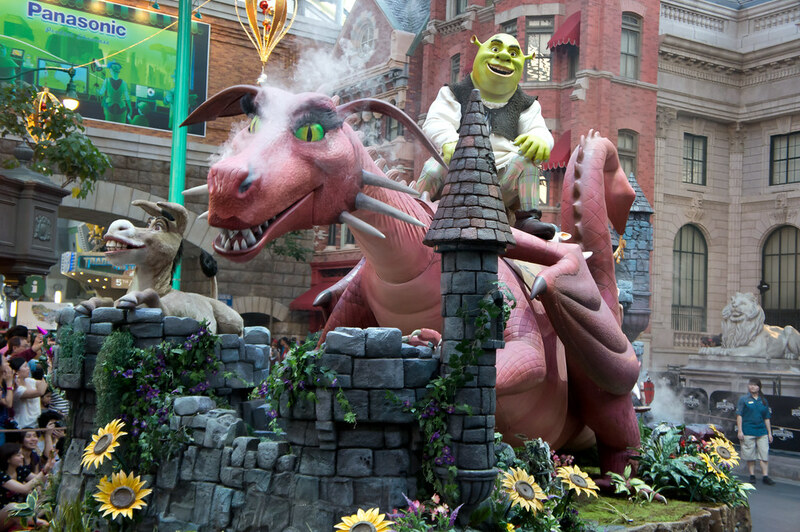 Take the Shrek and Jurassic Park floats for example. 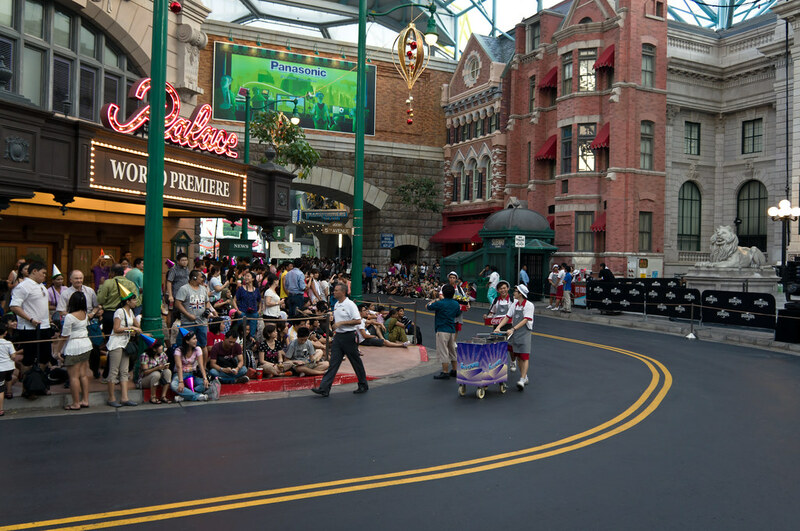 Yes, the whole parade is still small-scale compared to the Japanese and American Universal/Disney parks, but for Universal Studios Singapore – and understanding how small the pathways are and other circumstances – Hollywood Dreams Parade is a worthwhile addition to the park. 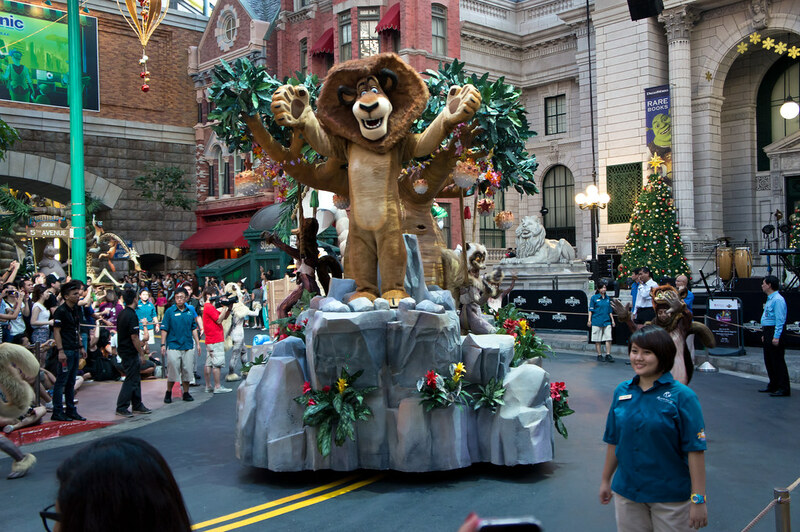 While I understand that today is the first time the parade was performed to park guests, the park needs to improve on the parade music, especially for an enclosed space like New York zone. 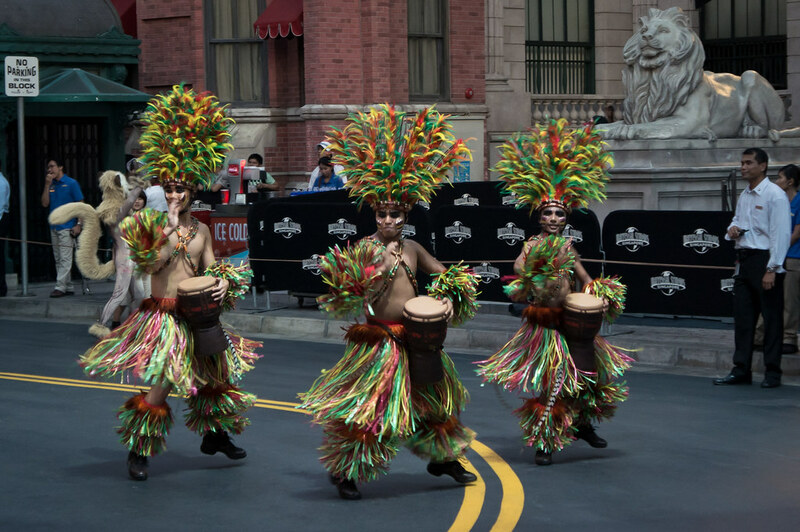 Rather than playing them off the parade floats (definitely not enough volume), it could be channeled through the park’s speakers. 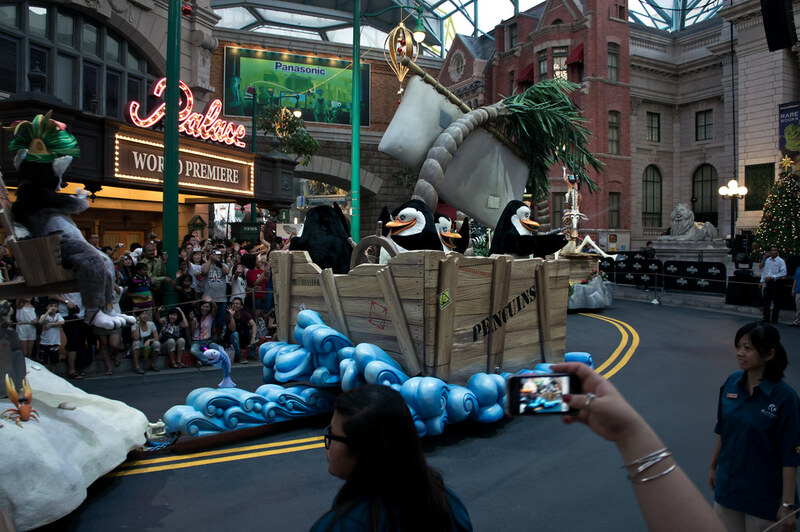 The usual park music at New York zone was a lot louder compared to the parade music. It’s a shame, because the theme song seems to be a very catchy one, but was too difficult to hear. Pacing could also be improved. 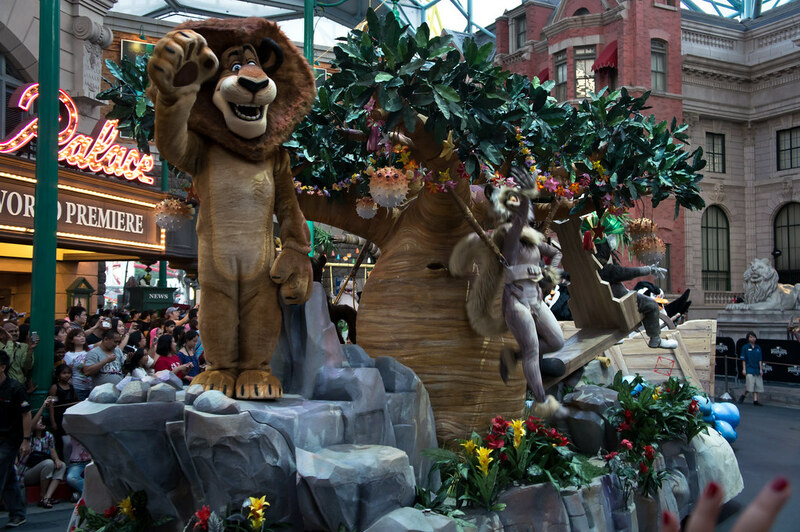 There is too much gap between some floats, causing moments where the visual action (and sound) to completely diminish until 15-20 seconds later when the next float arrives. There are definitely ample opportunities for mini-floats or just a few more costumed characters. Either that or the park could play the “Hollywood Dreams” theme in the background to keep the mood. I’m also surprised by the omission of a Sci-Fi City segment, given how that zone is the park’s crown jewel with three blockbuster rides. Crowd control is done similar to Disney parks, with ropes put in place before the parade starts. 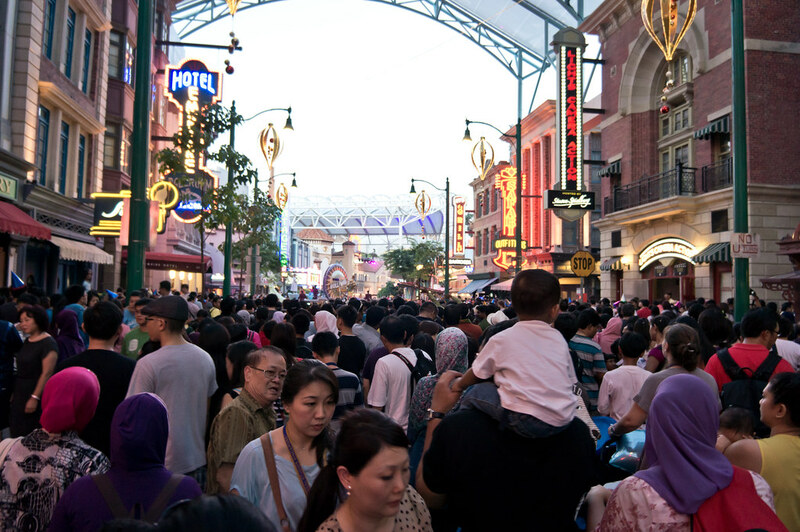 Given the walkways at USS are already crowded, viewing areas are extremely cramped. There is no room for proper seating (picnic mats etc) unlike other parks. I urge everyone to find a spot and camp until the parade starts. And once it starts, there is no moving around. For your own safety and the safety of others, stay where you are until the parade ends. Also take note that the streets can get extremely packed and hard to walk right after the parade ends. 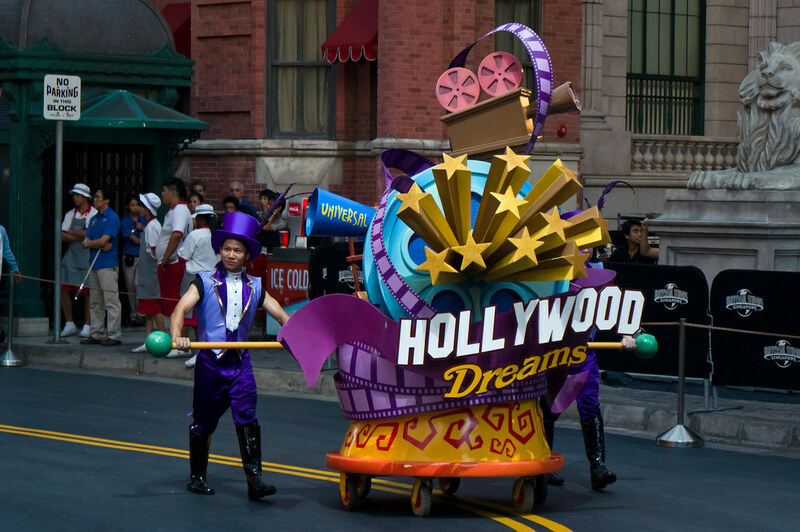 Hollywood Dreams Parade is a regular theme park attraction, and performs on Weekends and Public Holidays at 6:00PM. Check the park schedule during your visit for more information. Wow, it looks amazing, I must say. I know i said how the promo pics they uploaded on their website, etc. was slightly disappointing, but I truly am surprised. Yes, I am super happy that they didn’t reuse the ones from the grand opening, which was quite a let down (although those were a one time off, and this is more long term, so one can see the difference clearly). They can still work on and improve. 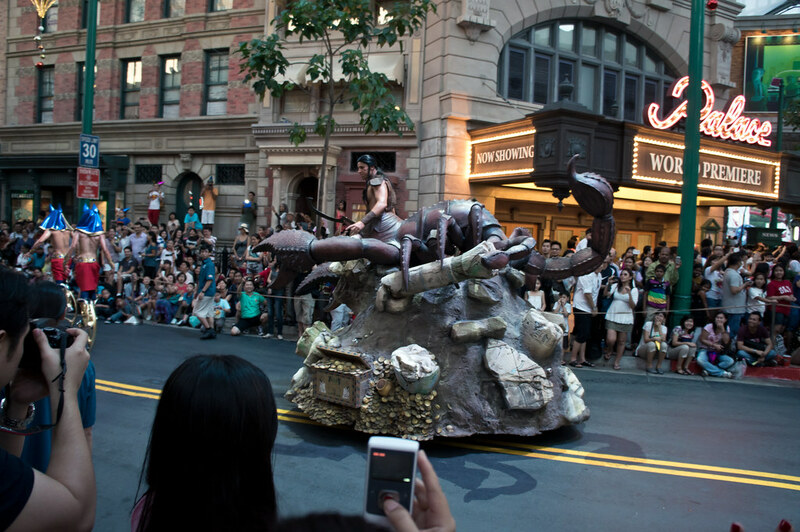 Many were disappointed that there aren’t tall floats but the thing is – the whole parade goes UNDER Battlestar Galactica. We should all go to the park and watch it! Heard Transformers The Ride was suddenly closed at around 11plus due to a fire-alarm being triggered inside the ride building. Guests were hurriedly evacuated and needless to say there were quite a few disappointed guests? Do you know what was the cause of the fire alarm? Will the ride be closed for an extended period of time? From what I’ve heard it was a false alarm (triggered within the queue area) but they have to close the ride due to protocol. Flames aren’t even used in the ride. The park would make an official announcement if the ride has to be closed for an extended period but there is nothing so far, fortunately. 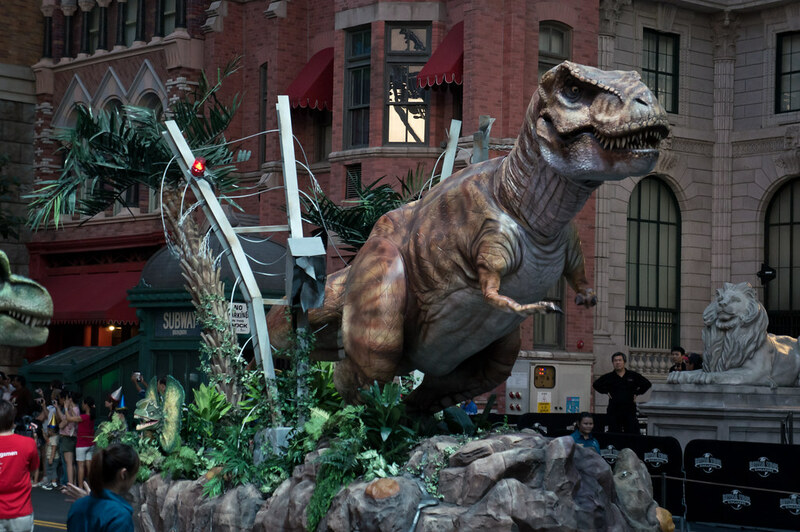 Dude that T-rex is AMAZING LOL, I’m sure it might actually be THE T-rex from the float ride haha! 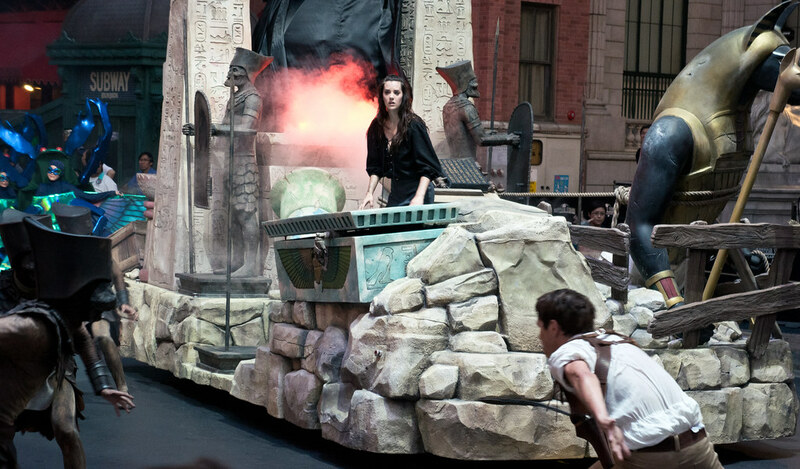 Anyway, how synchronised was the Mummy performance lol? I’m guessing the actors had to lipsync to the dialogue being played on the speakers? Yep, they lipsync for that part. It was a little off but its hard to notice since there’s a lot of action and running about. FYI, the animatronics your referencing are actually puppets. Hi there, thanks for pointing that out. Hi Micah! I guess this is what I call “I shouldn’t be writing at 2:30AM…” Haha. 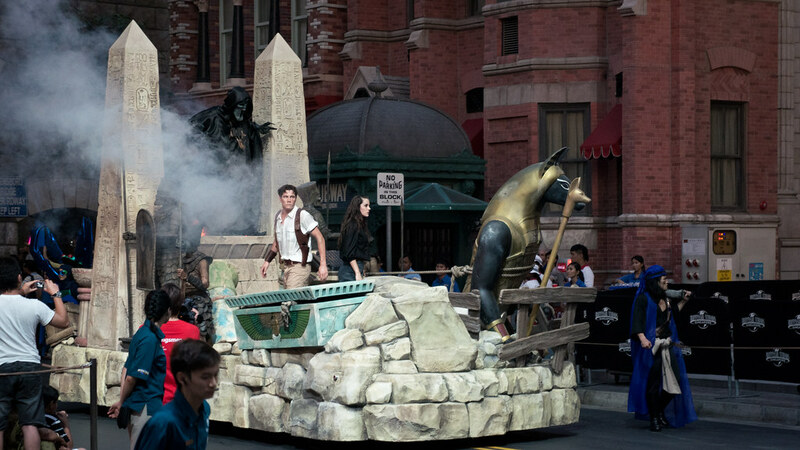 This parade is amazing to see at a Universal Park! !